‘Tis the season of eating. I had contemplated going to work out this past Sunday morning since I haven’t in weeks, but then Saturday night my friend who’s home from San Francisco for the holidays asked if I wanted to get brunch. I couldn’t pass up spending some time with my friend and I’m never one to pass up food so of course my answer was yes. We went to a restaurant nearby that has a great buffet brunch with everything from an omelet and carving station to crab legs. I definitely overate and luckily I wore a chunky sweater to hide the food baby. I love the color of this sweater. 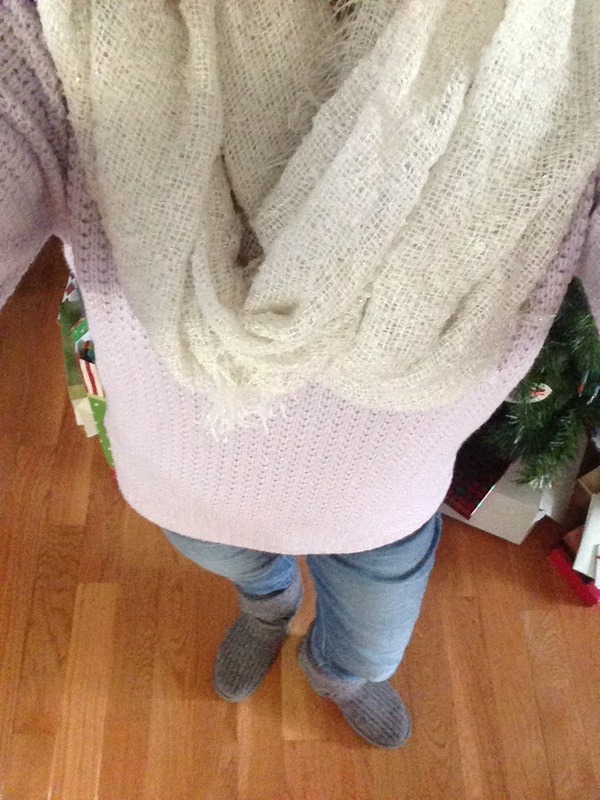 It’s such a soft purple and I think it’s unique that only the sleeves are cable knit. The scarf has small threads of silver so if you see it up close it gives it a little something special. It was a Christmas gift from a student and I can see myself getting a lot of use out of it! I was in some serious pain after this meal, but it was delicious and spending time with some friends over some good food is always worth it!